Last week, one-third of the country saw thermometers hit triple digits. Across the nation air conditioners were cranking up, and sprinklers chugged away as millions sought relief from the summer heat. While some are grateful for the relief provided by utilities, many are not mindful of the resources being consumed. On average, a commercial building can waste 30% of its electricity which costs companies thousands if not millions of dollars over time. Most people do not realize how much is used particularly in office spaces. Luckily, there are ways to identify where additional energy is used and where conservation efforts should be focused. 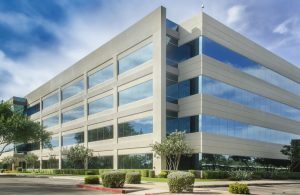 Overcooling in commercial buildings is a common problem. According to the Department of Labor, offices should be between 68 and 76 degrees throughout the year. Unfortunately, optimal temperatures vary from person to person and oftentimes the thermostat gets turned down too low. In addition to the added electricity that a space heater uses, a heater that’s too close to a thermostat can affect its reading, forcing it to cool the air down further. Opening windows and doors during warm days lets heat into buildings, forcing the air conditioner to work even harder. If an HVAC system is exposed to the outdoor environment, the amount of cooling or heating it has to do increases substantially. Equipment that is not maintained correctly can raise energy bills significantly. A heating system like an old radiator that cranks too much heat might have to be offset with a cooling system. Regular maintenance or replacement of faulty equipment is an easy way to keep costs low. Natural light reduces employee eyestrain and can improve mood. Turning off or reducing light output during the day can save big on energy costs. Leaving lights on can end up consuming, even more, energy than computers. Lights, cooling and heating systems should be timed to reduce their output. Since office equipment can account for 16% of energy use, computers should be shut off when employees leave for the day. Putting computers into sleep mode or shutting them down saves energy and can also help to ensure a company’s security. For more information how to save on electricity this summer, contact USI online or find a branch near you. USI believes that excellence in every step of the process and ensures timely completion and quality of service, time after time.